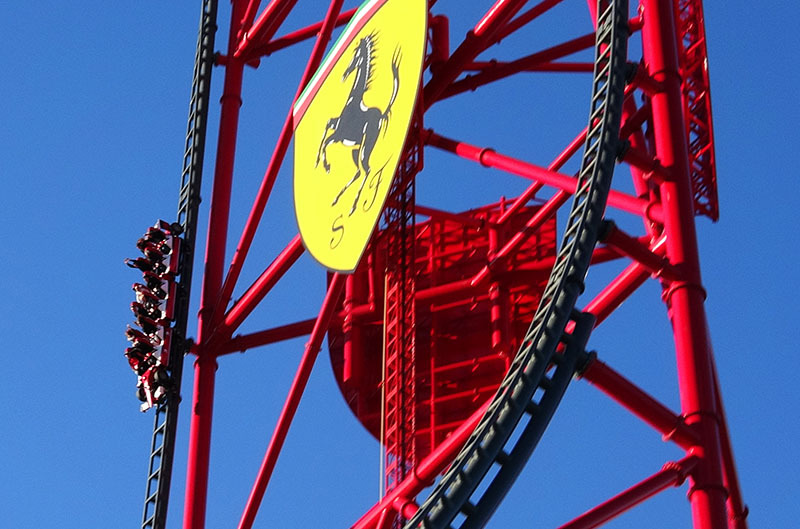 Standing at over 350 feet tall and accelerating from 0 to 112 miles per hour in 5 seconds, Red Force at Ferrari Land is Europe's highest and fastest rollercoaster. Ferrari World in the United Arab Emirates has Formula Rossa, the world's fastest rollercoaster. When they were conceiving Ferrari Land in Spain, the park's designers knew they would need a signature ride to match that, and thus Red Force came into being. It is billed as Europe's highest and fastest rollercoaster, and the stats are impressive. It is 367 feet tall, and reaches a maximum speed of 112 miles per hour just five seconds after accelerating from a standing start out of its station. Red Force's layout is pretty simple. From the station, the train is accelerated down the LSM launch track, flying past a grandstand seating area that gives non-riders an excellent view of the ride. At the end of the launch track, Red Force climbs vertically upwards 367 feet to reach the summit of the top hat element. From here, riders can briefly take in the spectacular mountain and sea surroundings, before the train begins plummeting vertically back down to the ground. Unfortunately the view on the way down isn't so spectacular - straight in front is the grey asphalt of a car park. Back at the bottom is a hill that gives a nice pop of airtime, before the train hits the final brakes and trundles back into the station. Apart from being nearly double the height and 50% faster, Red Force is very similar to Stealth at Thorpe Park. Sadly and perhaps surprisingly, however, it isn't as good: Red Force's train vibrates its way around the track making it much less smooth than Stealth. There isn't much extra done with the increased height and speed, and it doesn't feel quite so well paced. It is still a great ride, especially in the front seats, but for me Stealth has the edge. Bigger is not always better.